"On March 17, 1905, one of the most significant weddings in American history took place in a house in New York City at 8 East 76th Street, between Madison and Fifth avenues. At 3:30 p.m., [President Theodore Roosevelt's daughter] Miss Alice Roosevelt -- serving as a bridesmaid dressed in a white veil and holding a bouquet of pink roses -- opened the ceremony as she proceeded down the wide stairs from the third floor to the second-floor salon. The bride -- her cousin Eleanor Roosevelt -- followed, and behind her was President Theodore Roosevelt, who would give his niece away to the bridegroom, his fifth cousin Franklin Delano Roosevelt. "Eleanor wore a pearl necklace and diamonds in her hair, gifts from Franklin's rich Delano relatives. Even though Franklin had never made much money himself, Teddy knew that he would be able to care for his new wife: FDR was heir to the huge Delano opium fortune. 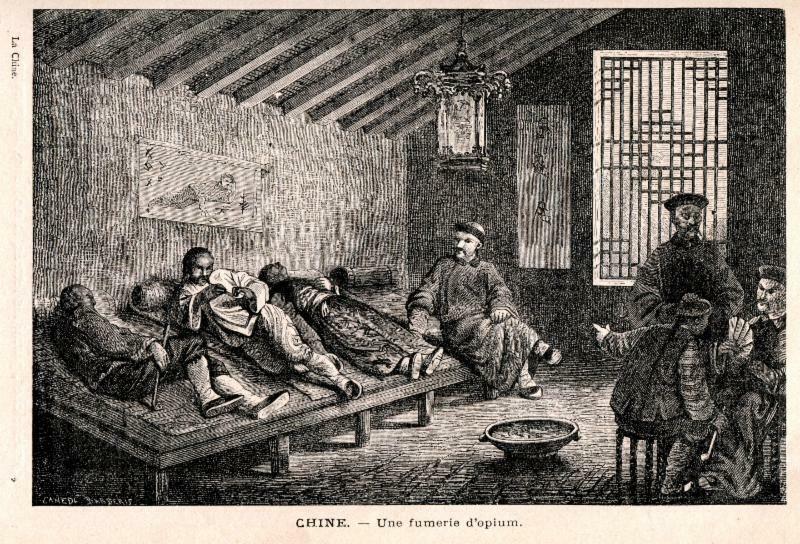 "China opium den, circa 1896"
"Franklin's grandfather Warren Delano had for years skulked around [China's] Pearl River Delta dealing drugs. Delano had run offices in Canton and Hong Kong. During business hours, Chinese criminals would pay him cash and receive an opium chit. At night, Scrambling Crabs -- long, sleek, heavily armed crafts -- rowed out into the Pearl River Delta to Delano's floating warehouses, where they received their Jesus opium under the cover of darkness. The profits were enormous, and at his death Delano left his daughter Sara a fortune that she lavished on her only son. "The Delanos were not alone. Many of New England's great families made their fortunes dealing drugs in China. The Cabot family of Boston endowed Harvard with opium money, while Yale's famous Skull and Bones society was funded by the biggest American opium dealers of them all -- the Russell family. The most famous landmark on the Columbia University campus is the Low Memorial Library, which honors Abiel Low, a New York boy who made it big in the Pearl River Delta and bankrolled the first cable across the Atlantic. Princeton University's first big benefactor, John Green, sold opium in the Pearl River Delta with Warren Delano. "The list goes on and on: Boston's John Murray Forbes's opium profits financed the career of transcendentalist Ralph Waldo Emerson and bankrolled the Bell Telephone Company. Thomas Perkins founded America's first commercial railroad and funded the Boston Athenaeum. These wealthy and powerful drug­-dealing families combined to create dynasties."